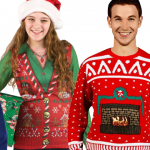 Ugly Christmas sweaters have become the ultimate trend in seasonal holiday apparel over the last few years. 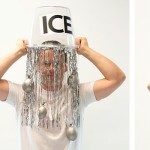 From ugly Christmas sweater parties, to licensed sweaters popping up in unusual places (heavy metal legends Slayer have been doing them for a while now, for example), it seems that ugly holiday sweaters are as common as candy canes and Christmas trees. 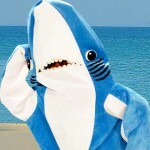 If you’re looking for where to buy ugly Christmas sweaters this season, BuyCostumes.com has you covered. 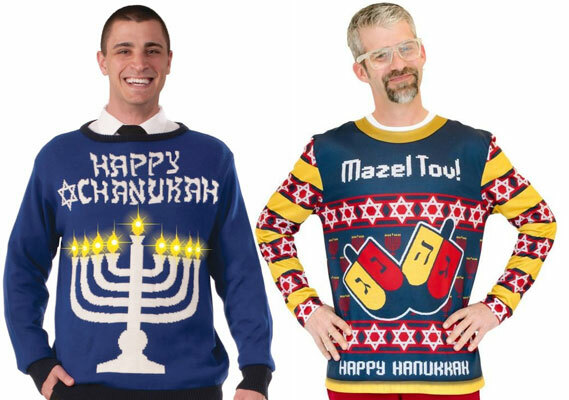 We’re running the entire gamut of ugliness, from mildly unpleasant Christmas shirts to totally absurd holiday sweaters that light up. 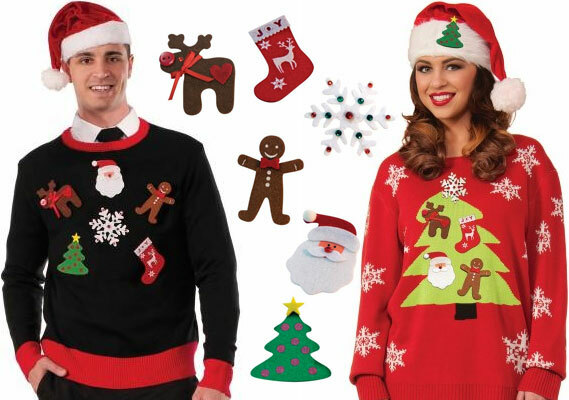 Keep on reading to find the perfect ugly Christmas sweater for you. Grumpy Cat is a good place start. Some might say that the Internet’s favorite cat jumped the shark when the Grumpy Cat’s Worst Christmas Ever movie came out, but nothing says Christmas quite like an angry cat face. 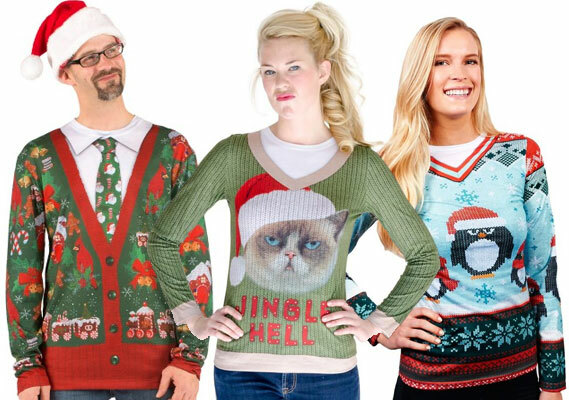 That’s exactly what the Grumpy Cat ugly Christmas sweater is, complete with the pun, “Jingle Hell,” for good measure. This one makes a great gift for the Grinches in your family or circle of friends. 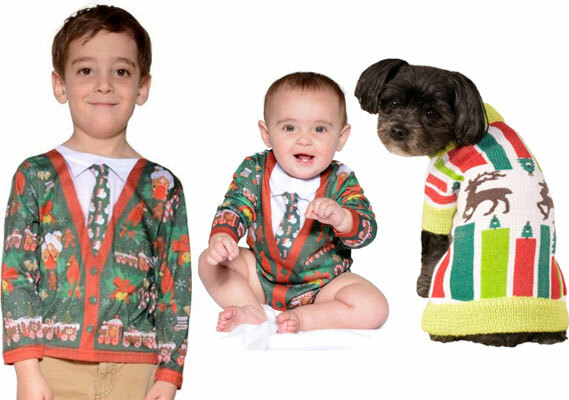 If you have a young child, don’t miss your chance to dress them up in ugly Christmas sweaters and other silly things. Before you know it, they’ll be old enough to protest. With mom, dad, and kids all dressed up in matching family ugly Christmas sweaters, you can create the greatest Christmas card photo of all time. Be sure to add some lens flare and improperly kerned text in Photoshop before sending it to the printer. It’s true – there is no species on earth that can escape from the whimsical holiday magic of an ugly Christmas sweater. On a more serious note, the reindeer patterned and striped sweater itself is made of a knit polyester blend, which is sure to keep your best friend warm during cold winter walks. There’s no reason fashion ought to trump fashion. For extra points, coordinate your dog’s clothes with your own look. This is more subtle by comparison, but it still features an obnoxiously large Menorah that lights up with built-in battery-powered LEDs. If your ugly holiday sweater doesn’t light up, is it really that ugly? “Happy Chanukah” is written above the light-up Menorah, with a Star of David pushing the second word of text off of center just enough to be upsetting. These ugly Christmas sweaters are strictly BYOS – that is, “bring your own sweater.” You can use any sweater that you already have in your closet, but it’s a little more fun to hit up your local thrift store and find something truly hideous first. There’s no such thing as “too ugly” when it comes to ugly Christmas sweaters. Then, to Christmas-ify your selected sweater, use the Christmas sweater add-ons and pins included in the kit. There’s a reindeer, a gingerbread man, a Christmas tree, and more. 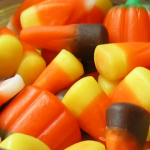 Just be sure to attach them to your sweater as asymmetrically as possible for maximum effect. 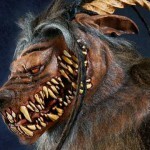 Also, feel more than free to add on to these decorations with your own brand of ugliness, too. Why not create some of your own Christmas sweater pins as well? If you aren’t a very crafty person, that’s totally okay. In fact, it’s perfect: this is one DIY costume project that’s supposed to turn out ugly, so break out the puffy paint and glitter glue. Craft foam and felt are two great materials to use for Christmas pins like this. After cutting out the desired Christmassy shape, just attach a safety pin to the back of it with some hot glue, and you’re good to go. To brighten up your ugly Christmas sweater even more, add a small (or, if you prefer, obscenely long) string of battery powered Christmas lights for some extra eye-searing holiday cheer. Glowing electroluminescent wire, or EL wire, is another option. Are you going to be ugly-ing it up this holiday season with a sweater of your own? 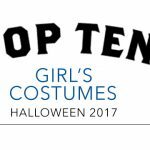 If you liked this post, then tell us what kind of costume ideas we should come with next on Facebook and on Twitter @BuyCostumes. Check out our Pinterest boards for more costume ideas like this, too.